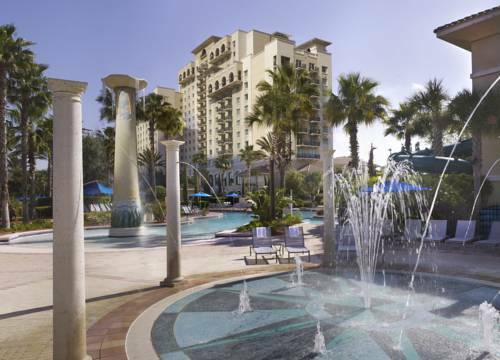 The Omni Orlando Resort at ChampionsGate is minutes from Orlando attractions yet worlds away from all of the distractions. The resort creates a haven for anyone in need of reprieve from long theme park lines and is located just off Florida I-4 corridor. Surrounded by 36 holes of Greg Norman-designed championship golf, Omni Orlando Resort is also home to the Leadbetter Golf Academy World Headquarters. A lighted 9-hole, par 3, and 18-hole miniature golf course, round out the resorts golf amenities. In addition to superb golf the resort is best known for its 15 sprawling acres of pools and recreation, highlighted by Orlando's only resort wave pool, a kids pool with three pool slides, an 850-foot lazy river and zero-entry family pool with corkscrew slide and water playground plus an adult pool and whirlpool, and 23 private poolside cabanas. guests will also enjoy luxury at our signature Mokara Spa, offering an impressive array of treatments designed to refresh and rejuvenate. The hotel is 100 percent smoke-free, including all guest rooms and guest areas (indoor and outdoor). Lobby Bar: The perfect place to gather with friends or business associates for a before or after-dinner cocktail. Hours Daily 1600-2359. Broadway Deli: Our grab and go deli offers sandwiches, gourmet salads, pizza and gelato. Perfect for the guest heading to the first tee or another activity at the resort. Hours Daily 1030-2100. Crocs Pool Bar and Grill: Poolside tacos, tequila, fresh salads, frozen cocktails and more. Open Daily 1000-2000 hours weather permitting. Pipers Grille: Located in the Clubhouse with views of the golf course. Grilled items served until 2 PM. Beverages, sandwiches served until 4 PM, features a menu of local signature brews, lively pub fare. Bagpiper plays at sunset from fall to spring; Complimentary golf cart shuttle takes guests to-from the resort-clubhouse. Davids Club: An upscale but casual sports bar and grill that serves Bourbon, crafts, and cuts and has beautiful golf course views, features six 42-inch plasma TVs and a 90-inch video wall. Overstuffed leather chairs as well as two pool tables. Call 407-238-6564 Daily Hours 1500-2359. Morsels: A great coffee bar featuring Peets cappuccino and expresso as well as morning bakery items. Located on the Lobby Level Retail Promenade. Daily Hours 0600-1500. Trevis: Trevis features Mediterranean style dishes in a comfortable family setting. Signature Art of Breakfast, traditional Napolitano and family-style Italian classics. Call 407-238-6564 or visit opentable.com for reservations. Daily Breakfast Hours 0630-1500 Daily Dinner Hours 1700-2200. Trevis Terrazza: An outdoor garden terrace and bar with firepit seating and ambient lighting. Trevis Terrazza serves light bites to full dinner, full bar, and a selection of Sangrias. Daily Dinner Hours 1700-2200. Meeting Room: A winner of numerous awards for its service to meeting and convention planners we offer more than 70 thousand square feet of meeting space as well. Every meeting room is equipped with state of the art audio visual equipment including modem and T1 connectivity. On site technicians are always available. The Omni Orlando at ChampionsGate is located at the heart of a beautiful 1200-acre golfing paradise only a few miles southwest of Walt Disney World. Complimentary scheduled transportation is provided multiple times daily to and from EPCOT Center and the Magic Kingdom which is the Walt Disney World transportation center that accesses all Disney attractions. 24-hour reservations are required and can be made at the Concierge desk, to guarantee specific departures from the resort. All area theme parks and adventure activities including SeaWorld and Universal Studios are within a short drive. The resort is only minutes away from world-class shopping including premier outlets and Mall at Millenia. The Atlantic Coast and Gulf Coast beaches are just an hour away. City CenterNo free shuttle transportation from property to City Center. No public transportation adjacent. City Center is not within walking distance of property. Orlando International AirportCommercial shuttle service is available through SuperShuttle. Direct to our property.Please call 407-888-9220 for reservations and additional information. This service is available 24 hours.